Susan B. Anderson: A Trip to Loganberry Books and Fine Points, Inc.
A Trip to Loganberry Books and Fine Points, Inc.
Today I want to quickly share a fantastic book shop and knitting shop in Shaker Heights, Ohio. 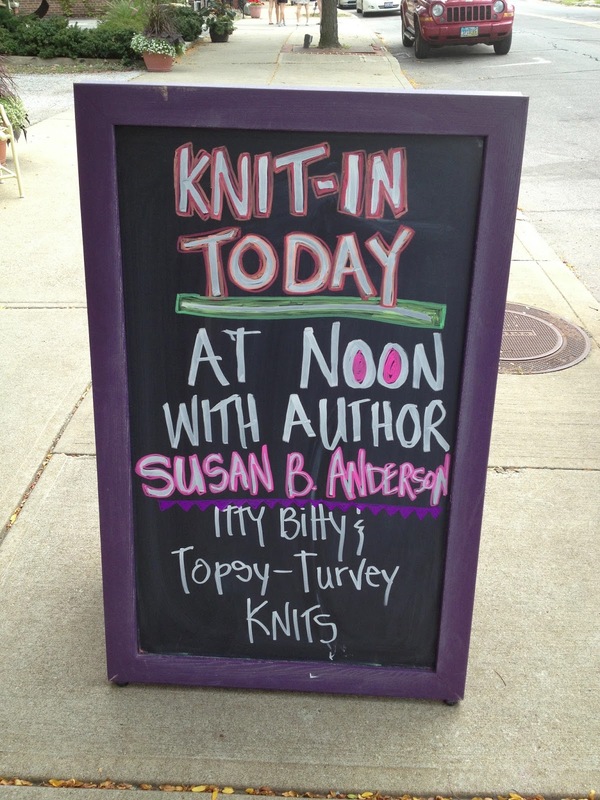 I went there on the Saturday after I filmed a segment for Knitting Daily TV. 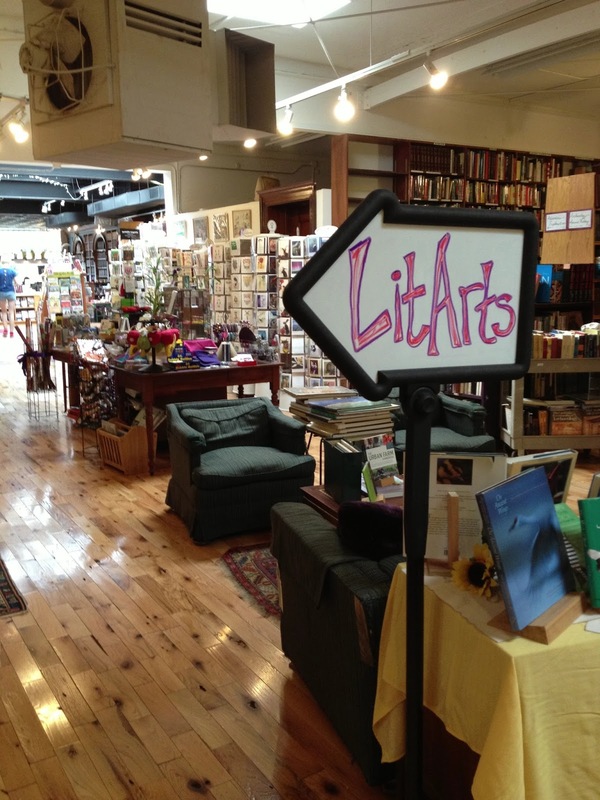 These are places you don't want to miss if you are in the area. 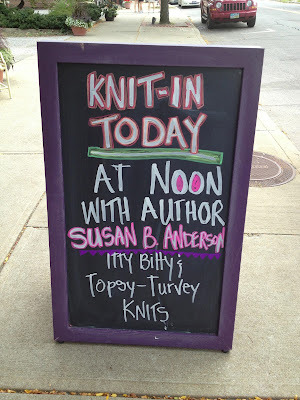 I had a knit-in/meet and greet at Loganberry Books that was held along with Fine Points, which is located in a charming old house right down the block. Right away when I saw the sign out front and the front of the shop I knew it was going to be a fun spot. The book shop had a cute front window display waiting for me. I was stunned at the size of Loganberry Books. 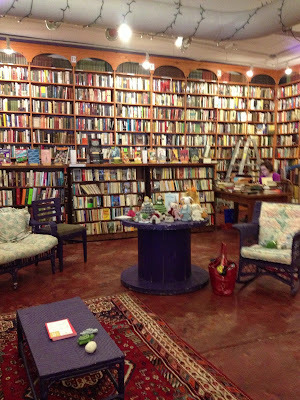 The front are was huge with walls and walls of books but then it went on and on in the back. 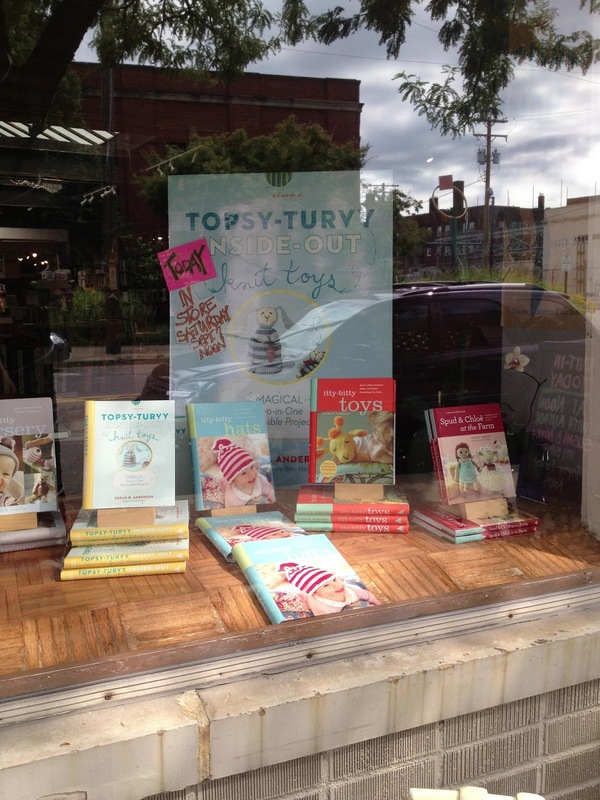 Above is the area I had the book signing. The kind staff cleared off a giant purple spool for me to put my samples on for display. Can you believe those books? The staff was incredibly fun and kind and helpful. These two buddies are from Itty-Bitty Toys but I always bring them along wherever I go. I always love handwritten signs. There were lots of cozy spots to sit and read sprinkled throughout. 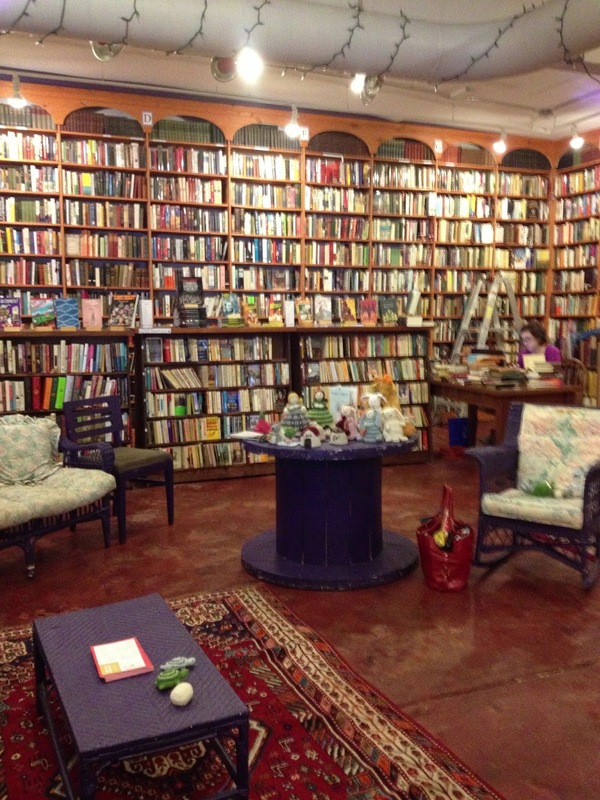 The shop sells both new and used books. 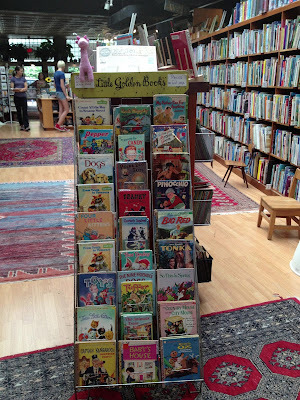 I loved this Golden Book display. This section held the Art books. 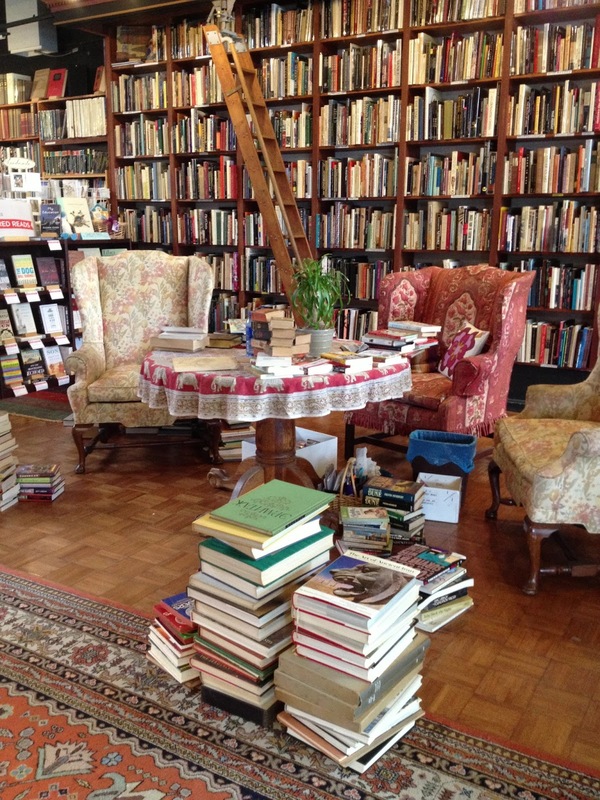 I would have loved to browse around in here for awhile. 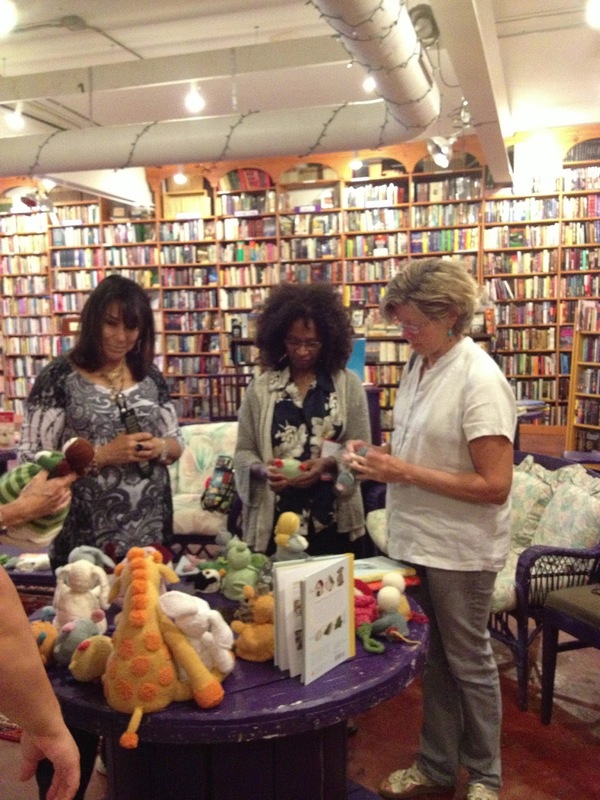 I had a great group of knitters show up. They were friendly and fun. 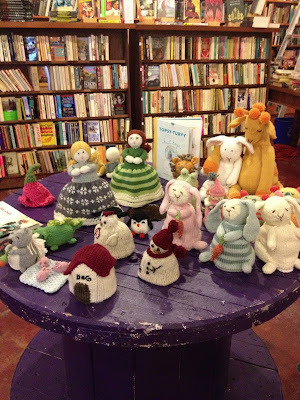 Some stayed and knit with me the entire time I was there and some popped in, had there books signed and left. Above is Kristi. 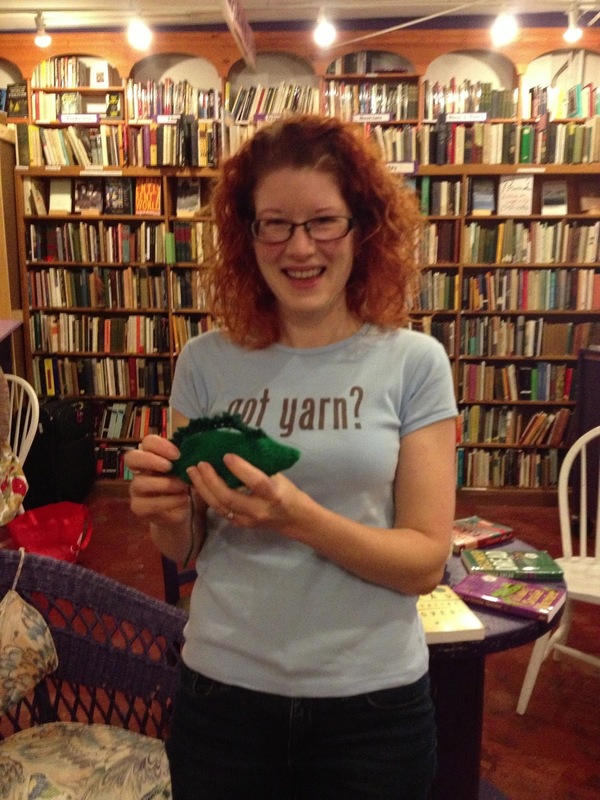 Kristi stayed and knit with me the whole time and I really enjoyed getting to know her a bit. She brought her Egg to Alligator toy which was almost finished. She had finished it by the end. I had the Egg to Turtle pattern for everyone to take. Kristi also finished the Egg part of that toy while she was at Loganberry. She is a speedy one. The knitters loved the toys. Here is Kristi again with me. 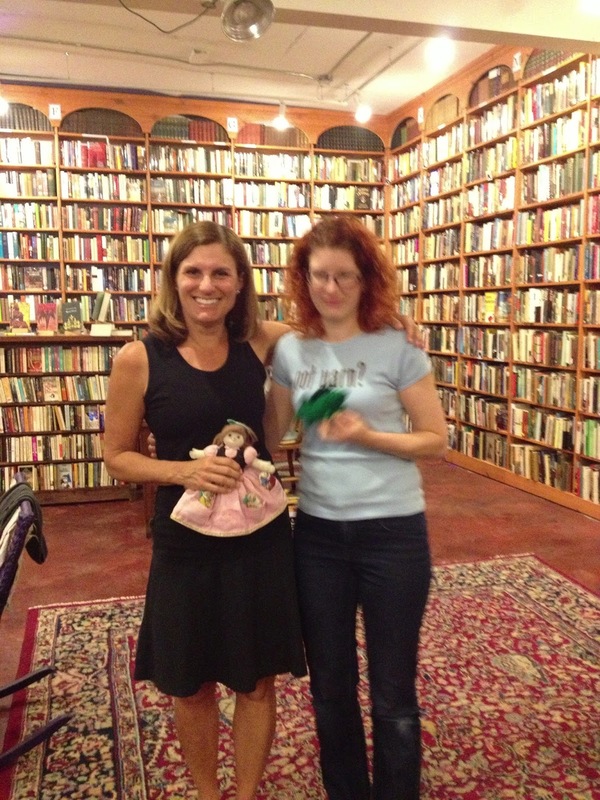 I am holding a fabric topsy-turvy doll they had at the shop. Someone had made it. It was Snow White on one side. In her skirt there were pockets that held each of the dwarves. This is Sarah from Fine Points. She brought yarn and needles from the shop in case anyone needed it and they did! Sarah is wearing a vintage dress from the 1960s and a sweater she knit. As you can see, she is pretty adorable. Sarah was fun to meet. 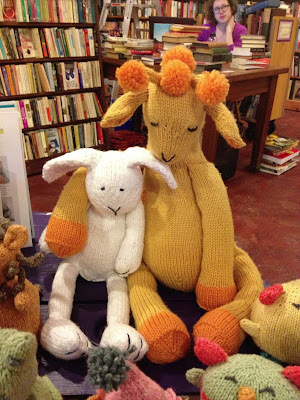 I wish I had the chance to get to the yarn shop. 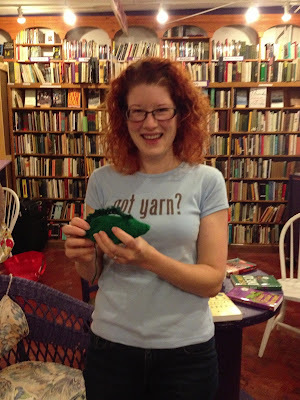 Sarah took a video of me telling about my favorite toy from the book and posted it on the Fine Points blog. Click here if you'd like to see the video. Thank you, Sarah, for attending the event and bringing supplies! Also, follow Sarah on Instagram if you want to see a ball of creative energy! She is sawdustsparkle, click here to see for yourself! These lovelies are in a knitting group together and they kept me company and chatted away. They were a fun group. I can tell they must have a great knitting time at their knitting group. I signed lots and lots of books. 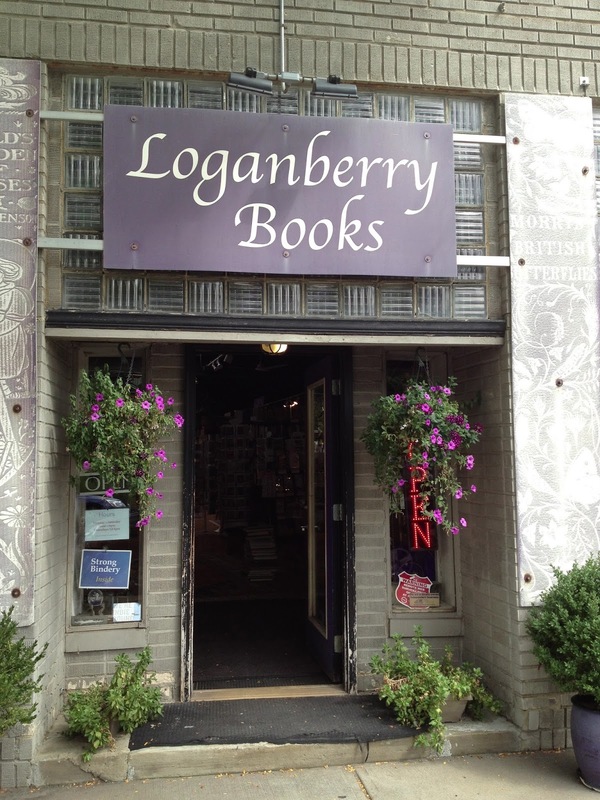 Thank you to Loganberry Books for having me. It was a very fun experience. 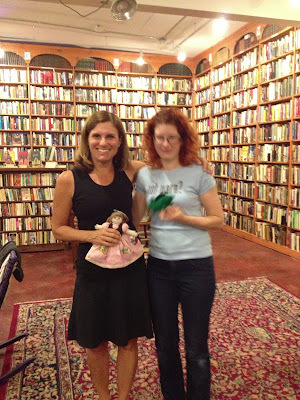 The knitters of Ohio are decidedly wonderful and kind. I'll be back very soon with the big announcement that got delayed last week! It looks like Loganberry and Fine Points provided you with warm hospitality which you naturally met with talent and enthusiasm. I wish I could have wiggled my nose Bewitched style and popped in to enjoy the afternoon with you.